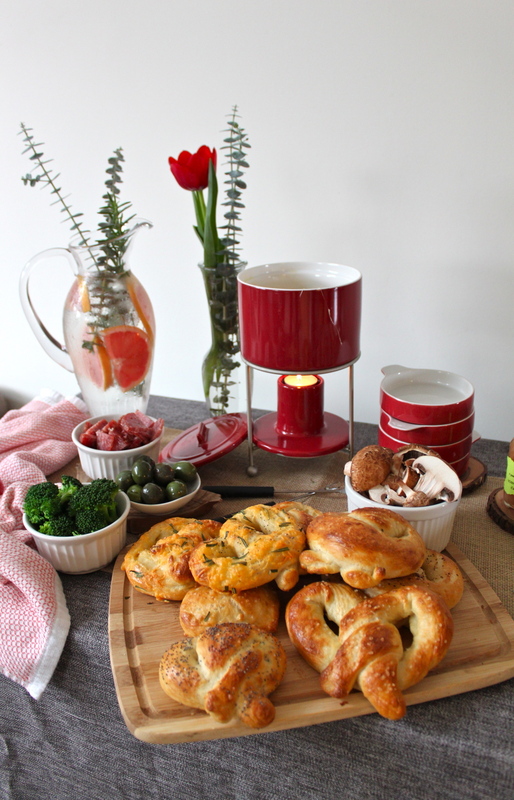 homemade valentine's day: gouda & gruyere fondue with soft pretzels. oh, valentimes. always inspiring me to make something fun & special at home. i got together with my galentine, sara, to make something fun for valentine's day weekend. 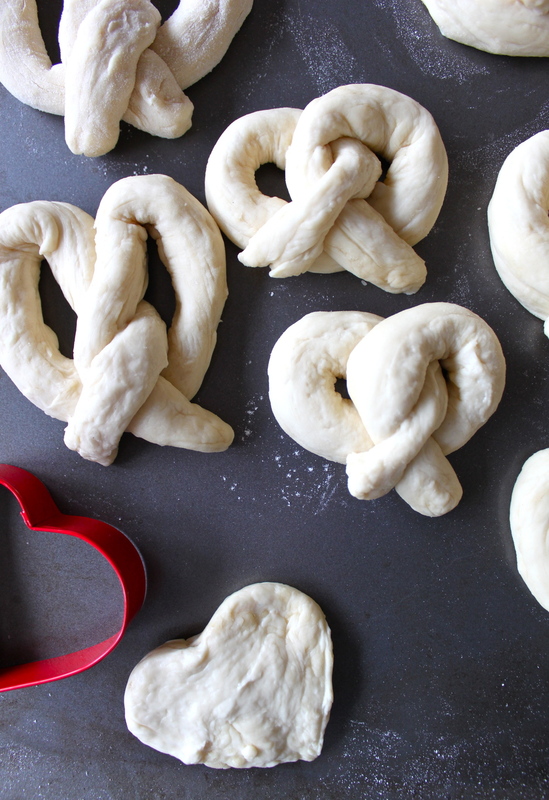 not sure how we landed on making pretzels, but we were set on it. actually, yes i do. we decided that one day we'll own a flower shoppe/bakery/taproom combo and we needed to practice our pretzel-making skillz to complement pete's brewery zone of the shoppe. its going to be great. we know next to nothing about starting/owning/running a brick-and-mortar business, but...at least now we know how to make pretzels. baby steps, people! first things first, sara brought over these deeelicious pistachio & blackberry croissants from the farmer's market. and local pear "gem!" haha we aren't sure why they wrote gem, but it is jam. fun to call it gem, though. local gouda, tooooo! check out sara's post about the fabulous local goodies that she generously picked up from the farmer's market for us that day. sara is the queen of highlighting cool small businesses and finding ways to support your community by shopping locally. foods just taste better and make you feel better when you know they were produced right in your neighborhood and not shlepped a zillion miles up a dusty highway to get to you. so, i made the pretzel dough in advance so we didn't have to wait ages for it to rise. 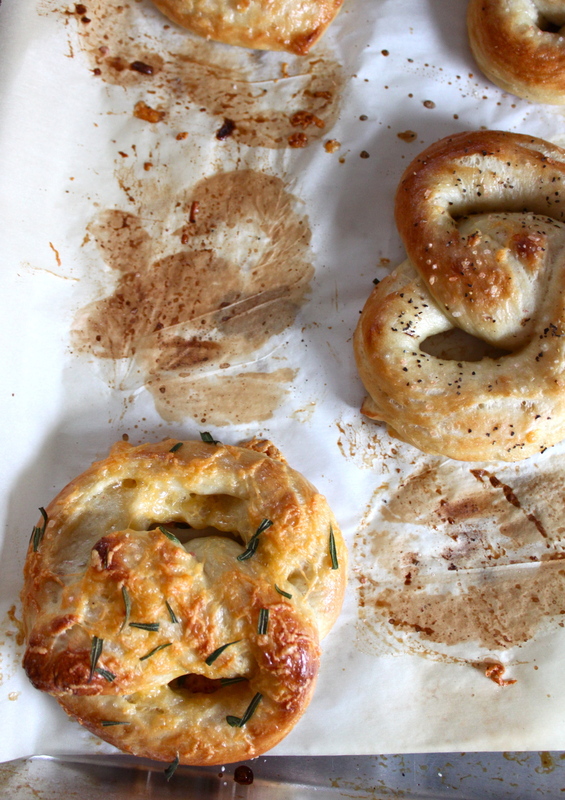 we used this soft pretzel recipe from real simple magazine. 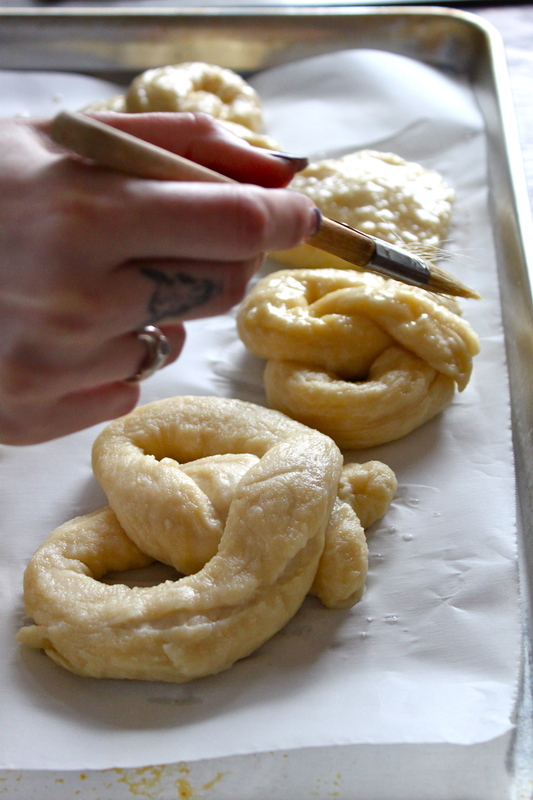 once the dough was ready, the pretzels were surprisingly easy to make. and when we figured out how to twist them, we were so excited! just look at those plumperoonies! 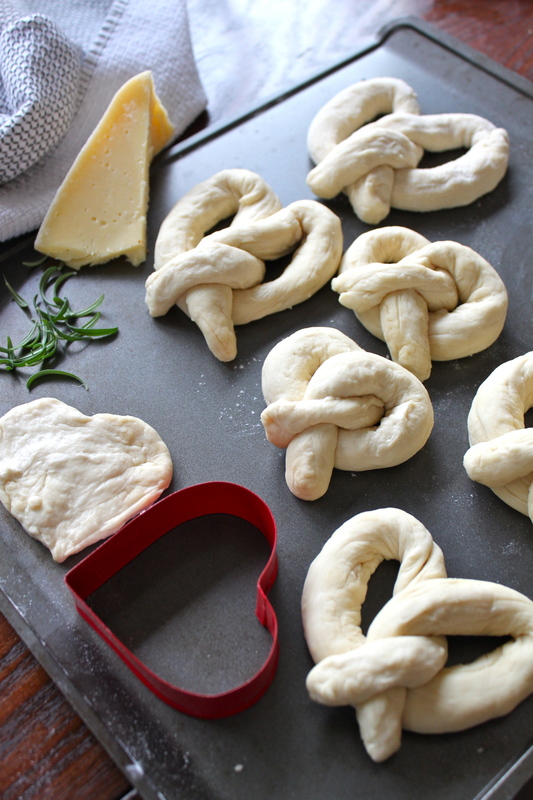 you boil the pretzels for about a minute, then dress 'em up on the baking sheet. brush on an egg wash (1 egg + 1 tsp water), add your desired sea salt, cheese, seeds, herbs, whateva you fancy. 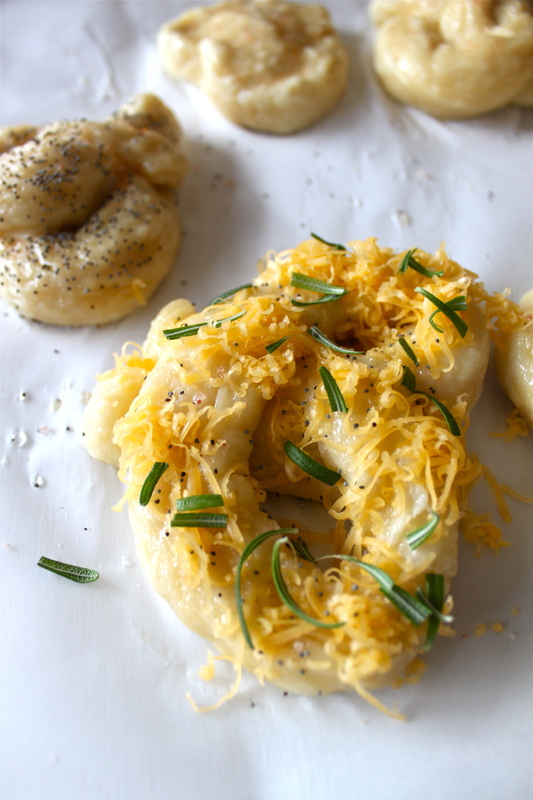 we used pink and white sea salt, poppy seeds, black pepper, sharp cheddar, and rosemary. they bake for just 10 minutes. and they actually looked like pretzels! we've done it! floral/baked goods/beer shoppe combo biz, here we come! 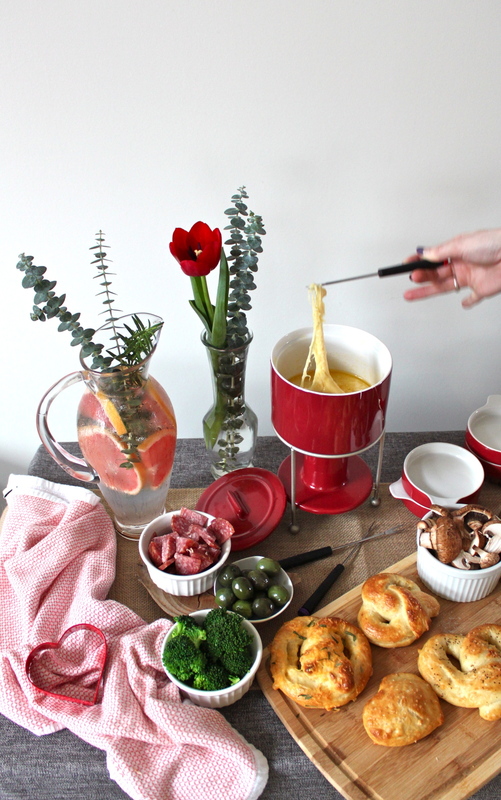 ...we quickly learned that there is more to making fondue than heating cheese on the stove. it would not stay melty and we ended up just eating it in bits because we were too hungry to fix it. apparently you need liiike some wine or citrus or something something. oh well ya live ya learn, amiright? pete joined us on the living room floor for our pretzel and fondue date. it was a pretty simple and fun valentine's treat for all three of us to enjoy together heheeeee. ps. those green olives you see.....$8! beware of the self serve zone of the grocery store, folks. we savored every last morsel of those buttery little green love nuggets anyhoo. so that's all that matters.